I've been cursing lately when trying to do crafts or work at my computer. Thought it was time for new glasses, but when I went to the optometrist, I discovered that it's much worse. I'm developing a lazy eye. Miniatures are indeed hazardous to one's health. Apparently the muscles in my right eye are straining when focusing at close range, and have decided to give up. 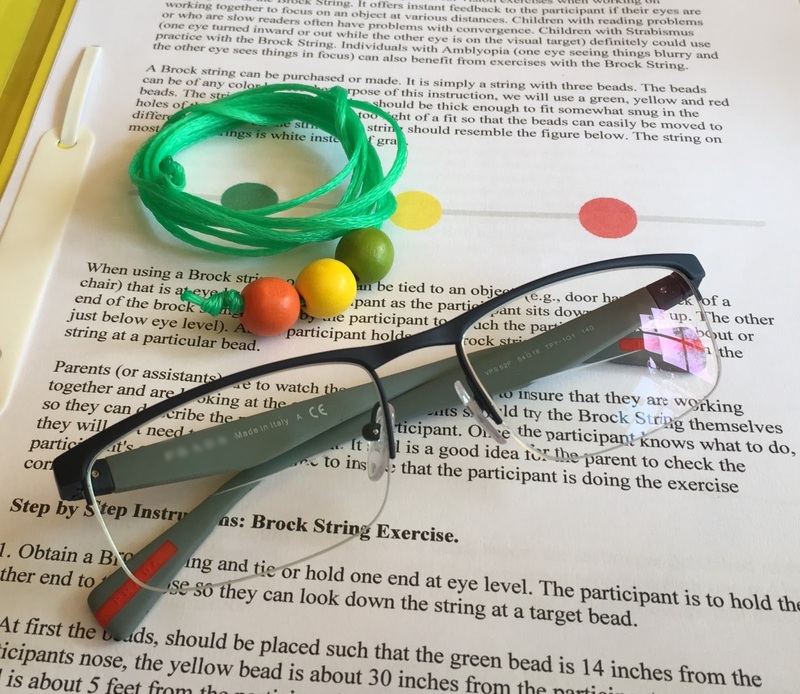 So it's not that I can't see, it's just that as soon as I concentrate my focus on one area for a few minutes, I lose binocular vision because my right eye wanders off to look at something else. It can be fixed with therapy, let's hope. 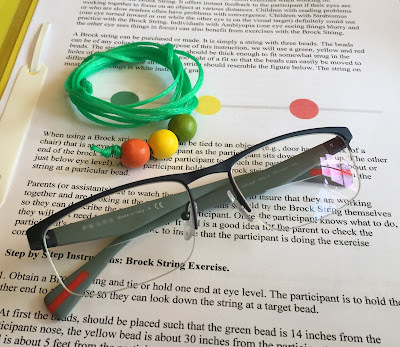 I received my colourful Brock String and new glasses on Monday. With diligent exercise and not working on miniatures for more than a few minutes at a time, I should see (literally!) an improvement in about eight weeks. Sorry to hear about your eyesight Megan but I'm glad that you have attended to it and that it can be corrected through therapy. All the close up work can be very tiring and stressful on your eyes, but sometimes we don't realize HOW stressful until we are having trouble seeing what is right in front of our noses. My first question to the optometrist was whether my condition was caused by something I did wrong. I'm obsessive about having enough light where I work, and always wear my special glasses/ use magnifying lamp/ use optivisor. He thinks it's just good old over use. Too many hours doing what I love! Thank you Lisa. Although I've always thought that working in good light and using my magnifiers were enough, it seems that one can also have too much of a good thing :-) Working in short snatches from now on, and doing my exercises, will fix it! Oh my! Yes I have my own issues working with miniatures, I have learned to switch continually between different tasks on different pieces to try and not overtax my eyes and hands. Hope the lazy eye is not so lazy soon! As my eyesight deteriorated, I thought that I was becoming hyperactive, or seriously lacking in discipline. I would work for a few minutes and lose concentration, feel the need to get up and do something different. Lack of eye muscle control is a factor in ADHD, and should be checked in children. So we learn! From now on I'm alternating 20 minutes of miniatures making with 20 minutes of moving around and 'resting' my eyes.